From sea to table. Our food is done fresh and simple with love. It's the real deal. All our delicious recipes are created with fresh locally sourced produce and wholesome ingredients. Offering personalised and memorable customer service in a relaxed vibe. Dine in for your next date night, family dinner, solo meal or catch up with friends. We also offer takeaway for a night off from cooking or a pit stop out of the office for a quick lunch. Yes, we are OPEN! Easter long weekend in Newcastle just got better. Also, open Anzac Day. Dine in with us to enjoy a seafood feast accompanied by a selection of local and international wines, beers and spirits. Our alfresco dining area overlooks the stunning Newcastle Harbour. Optionally, phone ahead for a pick-up takeaway order. We can customise an order to suit your preferences and to cater for the whole family. Contact us today to secure your booking or to place a pick-up order. Looking for the perfect gift idea? Maybe a gift for him or a gift for her? A gift that memorable and enjoyable by all. The ultimate thank you, birthday present, anniversary gift or just to delight your loved one or colleague. 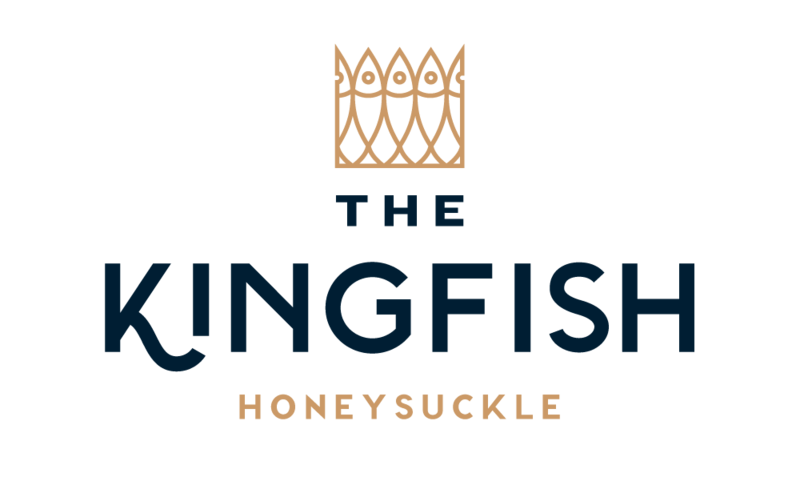 Treat your special someone with an indulgent dining experience by purchasing a Kingfish gift voucher today. Visit our location to purchase a beautifully enveloped hard copy version to gift the ultimate experience for your loved one. Alternatively, a quick and easy option is available to purchase a Kingfish E-Gift Voucher directly from our website. Add your own special message to the E-Gift Voucher that will be emailed directly to you or your loved one. Click through below to purchase your E-Gift Voucher today. We have that perfect relaxed vibe for your gathering right in the heart of the Newcastle. Our alfresco dining area looks out on the picturesque Newcastle harbour offering a beautiful ocean breeze or for mild weather the area is secured with clear blinds to keep you all cosy whilst still enjoying the view. We offer tantalising food and drink packages or selection from our main menu with the option of arranging an open bar tab from our fully licensed bar consisting of ice cold tap beer/cider, wines, spirits and more. Our menu aims to cater for all dietary requirements. Whatever your preference we will cater to suit you and your guests. Contact us today for more information and to secure your booking. Awesome food, atmosphere and staff. Everything was delicious and so affordable, and the staff were so friendly and attentive. Staff, food and atmosphere all fantastic! We will be back for sure! They have vegan fish n chips 😍what else do I need to say? Best place in Newcastle by far! Unless you want to pay $160 for a platter, your getting nothing more than expansive glorified average fish and chips. Yum ! food great for everyone including coeliac people too! Thanks! 5 Stars ⭐️ Fabulous food, staff and atmosphere! Thanks for looking after us last night Garry...delicious, tasty seafood...the Best! Amazing food. Such a great atmosphere. 100% would go back for there delicious food. Great service. Great chips, omg can totally recommend the grilled Tasmanian octopus. Thank you! Grilled octopus was fab thanks Great service too! The best seafood in Newcastle. Great service,staff and food. Was extremely happy. Very good dining experience. Food 10/10. Great seafood. Would definitely recommended giving it a try. I came with my young son for dinner, the staff provided exceptional service and the baby octopus was delicious! Great food, Great service. Nice relaxed friendly atmosphere. Certainly recommend. Will definitely be coming back. Loved the food, and wouldn't expect anything less than a 5 star quality from Garry! Went for dinner Monday night. Amazing food, friendly staff and generally fabulous atmosphere! Will definitely be back!! Amazing seafood with great customer service! Exceptional food and outstanding table service. Highly suggest the seafood platters! Great family atmosphere, service and amazing seafood.